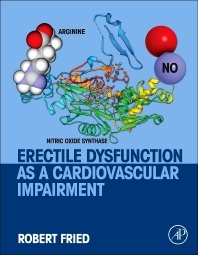 Erectile Dysfunction as a Cardiovascular Impairment organizes and summarizes the many aspects of biology and metabolism in cardiovascular and sexual function. Coverage includes how blood vessels are discovered to work, their role in hypertension, atherosclerosis, type-2 diabetes, oxidative stress, metabolic syndrome, and erectile dysfunction. Offers clinical research on vasculogenic erectile dysfunction predicting onset and severity of heart disease. Researchers and clinicians working in cardiology. 1.7 What Impairs Sexual Vitality? 1.23 Phosphodiesterase Type-5—Friend or Foe? 2.2 When Do We Know that We “Know” in Biological Science? 2.8 Hypertension—Paradoxically Beneficial in Erectile Dysfunction? 2.24 Can We Measure Nitric Oxide Production Directly? 3.7 How Does Hypertension Cause Erectile Dysfunction? 3.9 How is Blood Pressure Regulated? 3.17 What is the Connection between Atherosclerosis and Erectile Dysfunction? 3.33 How Does Diabetes Lead to Erectile Dysfunction? 4.18 Is the Endothelium Seamless? 4.25 How Advisable is Supplementing? 4.26 Is There an Age-Related Progressive Antioxidant Deficiency Syndrome? 5.2 What is Metabolic Syndrome? 6.6 How Independent Is the Endothelium-Independent Vasodilation Pathway? 7.7 Is Defective Transport a Possible Cause of Cardio-Sexual Impairment? Emeritus Professor, Doctoral Faculty of Behavioral Neuroscience, City University of New York (CUNY), New York, NY. Member American Physiology Society (APS) (Cardiovascular and Respiration division). Formerly, Director of the Rehabilitation Research Institute (RRI), International Center for the Disabled (ICD), New York, NY. Diplomate in Behavioral Medicine, International Academy of Behavioral Medicine, Counseling and Psychotherapy (IABMCP). Fellow, New York Academy of Sciences (NYAS).